Rogan Josh is Kashmiri in origin although it seems to be considered one of the "classic" Indian dishes - basically, it is a type of lamb curry with flavors of cinnamon, paprika, cloves and cardamom, among other things. "Rogan" means "oil," and "josh" means heat or boiling, so the name means something like "cooked in oil at intense heat." That being said, the dish does not require a lot of oil, at least the version I made, and if you use lean lamb it does not contain a lot of fat. Another benefit is that it will make your kitchen smell delicious. Finally, and most importantly, it tastes great and it is nearly foolproof if you have the right ingredients. This version will serve around 6-8 people, depending on the size of their appetites. The ingredients list may look a little daunting but if you have stocked up on the spices ahead of time, like I suggest, the rest of the ingredients are pretty standard. *Note #1: when you buy the lamb, getting it boneless will make your life much easier. You want to cut it into roughly 1 inch chunks, not too small because they shrink when they cook. Also, be sure to clean the fat and silverskin off them if there is any, this will make the pieces chewy. Anyway, on to the recipe. After cutting the meat into cubes, put it in a bowl and rub the chili powder and salt all over it and set aside. Heat the oil in a large pan and add the onions. Cook until slightly browned, then add the cardomom and bay leaves and stir. Add the meat, turn up the heat a bit and cook for two minutes, then lower it and simmer for 3-4 minutes, covered. To make the paste, toast all the spices and grind them with a mortar and pestle or in a coffee grinder. Add the other ingredients to a food processor along with the spice mixture and blend until smooth. I would, however, keep out the cinnamon and just add it whole to the onion mixture when you put in the paste. Unover the pan and stir in the paste, so it is coating the meat. Cover and cook for 5 minutes, then stir in the yogurt and add the hot water. Cover the pan and simmer for around 1 hour. Uncover the pan and turn up the heat so the sauce is reduced and thick and creamy, with not much additional liquid. This may take a little while, and when you are near done you should try a piece of lamb to make sure it is tender enough - at this point it should be, but if not, then add a little more water. Stir and add the garam masala and also salt and pepper to taste. 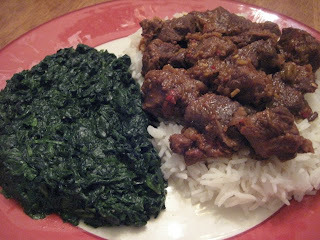 Serve with basmati rice. As with many stews, this becomes even better the next day, so don't hesitate to cook it the night before and put it in the fridge overnight.